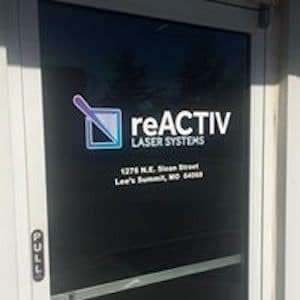 On December 4th 2017 the reACTIV Laser Systems acquisition of Accu Laser Engraving closed. We are now more than 120 days past that time and growing rapidly. During the acquisition period we set strong goals to decrease lead times, improve quality and build stronger customer relationships. Driving to those goals, to date we have had the fortune of moving and expanding to a new facility at 1276 NE Sloan, Lees Summit, MO 64086. The new location is more than 3 times larger than the previous allowing for additional equipment and expansion of employees. We immediately put the larger space to use with the addition of a second production laser which was commissioned early March. We are also in the process of installing our third laser system now. That laser system will be a scan head driven Co2 laser. This Co2 laser adds a new offering to the reACTIV Laser mix of laser service capabilities as we can now process organic materials such as wood, leather, additional composite plastics and more. We have also added a new visual inspection machine with 3x – 90x power magnification. This allows for a high level of visual inspection for all marking and engraving services. Our visual inspection machine will also have positional verification of marking and engraving to an accuracy of 0.0002” in. This greatly improves our ability to quality control all laser marking and engraving in house. As we continue forward we would like to thank all of our wonderful customers. We are driven to build solid relationships through problem solving, quality services and world leading technology in laser system offerings. With out all of you that would not be possible.